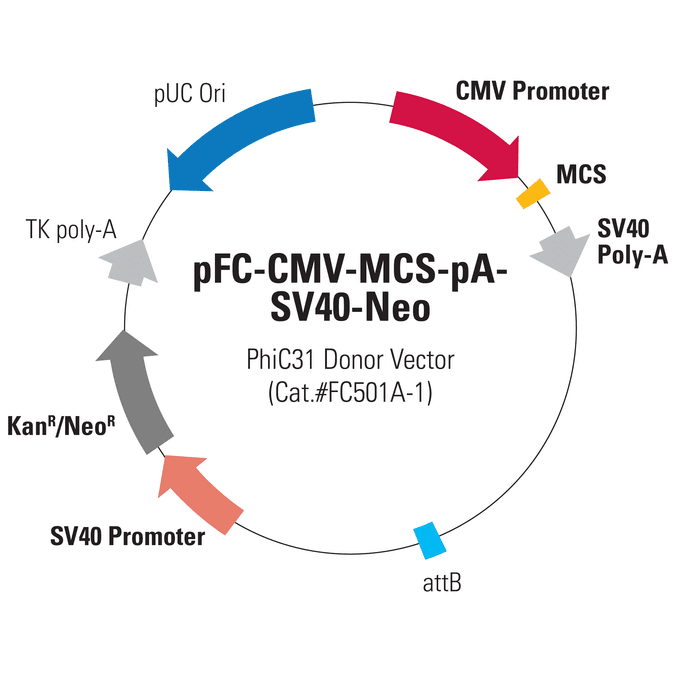 Use the one-step, non-viral pFC-MCS-pA-SV40-Neo PhiC31 Donor Vector to integrate your promoter and gene-of-interest expression cassette into a host cell’s genome using the PhiC31 Integrase System. Simply co-transfect with the PhiC31 Integrase Expression Plasmid (Cat.# FC200PA-1) and select for integrants using neomycin resistance. Your gene-of-interest will be driven by the strong CMV promoter, which is commonly used in most cell lines, such as HeLa, HEK293, and HT1080.